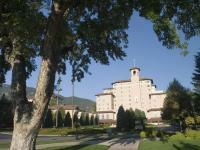 The Southwest region of Colorado Springs is an eclectic mix of new and old. This area boasts many of the city’s most prestigious neighborhoods. Anchored by the famous historic Broadmoor resort, mansions built in the 1940s, 1930s and even 1920s can be found along side a few newer mansions. Large homes on large lots often have Gamble oak stands and visits from wild life. Great views of the city lights are found in this area and Cheyenne Mountain school district is known around town to be one of the best.